During Y7 pupils will read a variety of poetry, prose, and drama texts by a range of modern and classic writers including Shakespeare and 19th Century prose authors. They will be taught a range of skills, including how to break down a text; how to analyse the impact of a writer’s word choices and how to create their own creative and analytical texts. They will be encouraged to consider how language choices, sentence structure, paragraphing and punctuation play an important part in shaping meaning and engaging with the audience. These skills will be tested in the end of year assessment; a test in Creative Reading and Writing designed by the AQA examination board to mirror the style of the GCSE English Language examination paper. Pupils study a unit on “Autobiography”. This includes a significant spoken language component; the analysis of model autobiographical writing from a range of sources and the production of their own autobiographical ‘text’. This piece of original writing forms the basis of the main Y7 assessment for this half term. They will also be introduced to the skills necessary for the formal literary analysis of poetry. Pupils focus on the detailed analysis of a significant short story by an acclaimed modern author (Currently ‘A Sound of Thunder’ by Ray Bradbury). The unit will focus on an exploration of the writer’s craft. It will examine the use of descriptive and figurative language in narrative and include a character study of one of the main characters. This piece will form the basis of this term’s written assessment. Homework: Pupils are set homework once each week. This is usually a task related to the text or subject studied; stand-alone pieces, research tasks and preparation pieces may also be given. This half term pupils will study one novel from a range of age appropriate texts written by a contemporary author specialising in fiction for young people. The focus of study will be character, setting and structure. In preparation for the end of year assessment, pupils will also gain experience of producing a piece of creative writing from a picture stimulus. This will form the basis of this term’s assessment piece. The work of this half term should allow for the further exploration of ideas, issues and themes emerging from the study of the novel in term one. Additionally, this term the course aims to develop pupils’ understanding, appreciation and enjoyment of Shakespeare and his use of language. Through a study of extracts and short passages pupils will become more familiar with Shakespeare’s language and use of imagery. The emphasis is on increasing understanding through analysis, dramatic reading and performance. This half term pupils will be given the opportunity to deepen further their experience of Shakespeare through engagement with longer passages and key scenes. Where appropriate, a whole play may be studied. Pupils will examine key aspects of character portrayal, plot and themes. An extended character study or a written examination of key themes will form the basis for a key assessment. Pupils will be given the opportunity to produce a piece of creative writing emerging from the study of Shakespeare. This should also be seen as preparation for the end of year assessment in the second half term. The central focus of this half term will be the end of year ‘Creative Reading and Writing’ assessment test, designed by the AQA examination board for Year 7 pupils which mirrors the format of the GCSE English Language examinations. Questions will test the appreciation of characterisation; structure and how writers use language to achieve their effects. Pupils will be able to draw on the skills they have developed throughout the year to produce both critical and creative responses. Pupils will also have the opportunity to experience and critically evaluate a wide selection of modern poetry at the end of the year. During Y8 pupils will read a variety of poetry, prose, and drama texts by a range of modern and classic writers including Chaucer, Shakespeare and 19th Century prose authors. They will be introduced to an increasing range of texts written before 1900 to increase their familiarity with them. They will be taught a range of skills, including how to break down a text; how to analyse the impact of a writer’s word choices and how to create their own creative and analytical texts. They will be encouraged to consider how language choices, sentence structure, paragraphing and punctuation play an important part in shaping meaning and engaging with the audience. These skills will be tested in the end of year assessment; a test in Creative Reading and Writing designed by the AQA examination board to mirror the style of the GCSE English Language examination paper. Pupils will study a range of advanced autobiographical prose texts, including those written for an adult audience, to develop their awareness of the characteristic features of this genre. Aspects of language, style, structure and viewpoint will be examined in detail to increase understanding of how writers shape meaning to influence the reader. These texts will serve as style models for pupils’ own autobiographical writing. Their prose pieces will form the basis of this term’s assessment. Pupils will additionally study a small number of autobiographical poems by established modern poets. They will have an opportunity to write and perform their own autobiographical poems. This half term pupils will study a variety of portraits from Chaucer’s Prologue to the Canterbury Tales. These will be studied in translation but where possible in the original Middle English. The focus will be Chaucer’s use of the direct and indirect method of character portrayal. Pupils will read at least one of the Tales in modern English and consider the themes and issues raised. The character study will form the basis of this term’s assessment. Additionally, this half term pupils will develop the skills necessary to produce a discussion style essay on a topic of interest to them and their age group. They will be given the opportunity to discuss and debate these issues. Where appropriate they will be introduced to the skills of structured formal debate. Pupils will study a range of ballads both modern and pre-1900. This should include key extracts from the Rime of the Ancient Mariner, although some groups may study the whole poem. Pupils will be given the opportunity to develop their creative writing skills by writing descriptive passages based on Gustav Dore’s engravings of the poem. Pupils will also produce a literary analysis of part of this or any other ballad drawn from the literary heritage tradition (eg. La Belle Dame Sans Merci – Keats). These pieces will form the basis of this half term’s assessment. Pupils will be introduced to the Sherlock Holmes stories of Sir Arthur Conan Doyle. They will focus on the presentation of characters in 19th Century Prose. They will have the opportunity to compare the presentation of Villains in modern fiction with characters within a Sherlock Holmes story. Pupils will have the opportunity to extend the appreciation of 19th Century fiction through a deeper study of Sherlock Holmes stories or other examples of classic prose texts. An appreciation of the genre may be used as an inspiration for pupils’ descriptive or narrative work – eg. the production of a piece of historical fiction. In the second part of this half term, pupils will study a play by Shakespeare with a focus on language, characterization, setting and structure. They will produce a comparative literary analysis of the whole play or at least two key scenes. This will form the basis of this term’s assessment. The central focus of this half term will be the end of year ‘Creative Reading and Writing’ assessment test, designed by the AQA examination board for Year 8 pupils which mirrors the format of the GCSE English Language examinations. Questions will test the appreciation of characterisation; structure and how writers use language to achieve their effects. Pupils will be able to draw on the skills they have developed throughout the year to produce both critical and creative responses. Pupils will also study a modern novel or novella by an author with a significant literary reputation. During Y9 pupils will read a variety of poetry, prose, and drama texts by a range of modern and classic writers including Shakespeare and a range of 19th Century prose authors. In preparation for a challenging element of GCSE English Literature, they will be introduced to an increasing range of texts written before 1900. They will be taught a range of skills, including how to break down a text; how to analyse the impact of a writer’s word choices and how to write their own creative and analytical texts. They will be encouraged to consider how language choices, sentence structure, paragraphing and punctuation play an important part in shaping meaning and engaging with the audience, in their own writing and in the writing of others. These skills will be tested in the end of year assessment; a test in Creative Reading and Writing designed by the AQA examination board to mirror the style of the GCSE English Language examination paper. The aim this year is to rehearse and embed all the skills necessary for the coming challenges of the GCSE courses in years 10 and 11. Pupils will analyse the language features of a number of persuasive pieces in a number of iconic speeches from a range of time periods. One speech will be analysed in test conditions and will form the basis of this term’s assessment. Using these speeches as style models, Pupils will write and present their own speeches. This term pupils will study a number of modern short stories and will examine the relationship between language, structure and the themes explored by the authors. Pupils will use these stories as style models for their own narrative writing in which they consciously use language devices linked to clearly identifiable themes. Pupils will use a variety of style models to produce ‘advanced’ book or film reviews. Pupils will study a range of 19th Century stories by authors such as Hardy and Dickens focusing on the characteristic features of the genre. They will write an in-depth analysis of one of the stories or produce a comparative analysis of at least two. This will form the basis of the key assessment. Pupils will also study a number of modern poems unified by a common theme. Pupils will study sonnets by classic poets, including Wordsworth and Shakespeare, in order to explore the nature of the different sonnet forms. This will lead on to a study of extracts and key scenes from some of the more demanding Shakespearean texts in preparation for the study of a complete play by Shakespeare. Students will study a complete play by Shakespeare exploring language, structure, themes and issues. They will produce a response to a GCSE literature examination question which will be a key assignment. Students will then study a modern novel by authors with an established literary reputation. The novel will be of the quality and level of difficulty of those traditionally studied at GCSE. 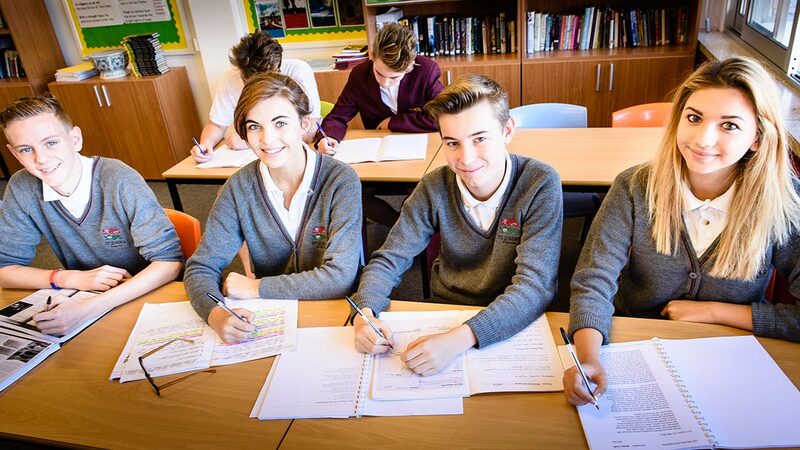 The central focus of this half term will be the end of year ‘Creative Reading and Writing’ assessment test, designed by the AQA examination board for Year 9 students which mirrors the format of the GCSE English Language examinations. In responding to questions on characterisation, structure and the impact of language on the reader, pupils will be able to draw on the skills they have developed throughout the year. In the latter part of the term pupils will study modern poetry which, in preparation for study at GCSE, will include an unseen element. Pupils will be taught the skills necessary for each component of the English Language Paper 1. The focus will be the analysis of the language, structural features and presentation of character in texts. Pupils will also study a selection of poems taken from the English Literature Poetry anthology. The selected section for study this year is ‘Power and Conflict’. In preparation for paper one of the English literature examination, the focus of this term will be the 19th Century Novel. Pupils will study one of the novels from the prescribed list in preparation for the relevant section of the GCSE English Literature examination. The selected text this year is ‘A Christmas Carol’ by Charles Dickens. Homework: Pupils are set homework once each week. This is usually a task related to the text or subject studied; stand-alone pieces, research tasks, examination questions and preparation pieces may also be given. Study of the 19th Century Novel will be completed in this term. Pupils will then focus on developing the skills necessary for English Language Paper 2 ‘Writers Viewpoints and Perspectives’. The explicit skills of comparison between texts will be taught. Pupils will study a further selection of poems taken from the poetry anthology. They will focus on the skills of comparison; maintaining a critical style and using appropriate critical terminology when exploring the writers’ craft. This term pupils will study a selection of unseen poems. They will focus on developing the skills for responding to questions in section C of the English Literature paper 2. Pupils will undertake preparation for the mock examination – English Language Paper 1 & 2 with a specific focus on the writing tasks. Time will be equally divided between narrative and non-narrative genre. Pupils will produce one narrative and one non-narrative text which will form the basis of this term’s assessment. End of year examinations in English Language Paper 1 & 2 and in key aspects of English Literature Paper 1 & 2 (A Christmas Carol and The Poetry Anthology) will take place in this term. In the post examination period further selections from The Poetry Anthology will be studies. Themes relevant to the study of J.B.Priestley’s ‘An Inspector Calls’ may additionally be introduced. This term will be devoted to a study of J.B. Priestley’s ‘An Inspector Calls’ in preparation for English Literature Paper 2. The focus will be on the themes and issues addressed in the text; on the techniques that Priestley employs and on the language choices he makes to impact on the reader. In this half term pupils will sit their mock examinations in English Language Paper 1 & 2 and in key aspects of English Literature Paper 1 & 2 (A Christmas Carol and An Inspector Calls). Time will be devoted to refining the skills necessary to perform strongly in these examinations. In the post examination period attention will turn to preparing students for the Spoken Language presentations. Homework: One piece of homework a week the focus of which will be related to the unit currently studied or an unrelated examination practice question. Pupils’ Spoken Language Presentations will be delivered to an audience and formally assessed. Pupils will then study one of the Shakespeare plays selected from the prescribed list in preparation for the GCSE English Literature Paper 1. Pupils will complete the study of the selected Shakespeare play for the GCSE English Literature Paper 1. Any remaining poems from the Poetry Anthology will be completed this half term. Revision of previously studied Anthology poems will commence. Homework: One piece of homework a week the focus of which will be related to the unit under review or an unrelated examination practice question. External GCSE examinations in English Literature Papers 1 & 2 will take place in this half term. Revision, according to the needs of each teaching group, will therefore be the main focus of study. Revision for English Language Papers 1 & 2 will also take place. External GCSE examinations in English Language Papers 1 & 2 will take place in this half term. Homework: At least one piece of homework a week mainly related to the units studied or, alternatively, unrelated examination practice questions for both English Language and Literature.